Linoleum is a material made from a composition of linseed oil, cork, wood flour (a fine sawdust), and powdered minerals such as calcium carbonate supported by a burlap backing combined under heat & pressure to form a sheet. Once a common flooring material, it was broadly replaced in common household use when less expensive vinyl flooring materials became available. The linoleum sold for carving plates used in relief printing has a different composition than the current linoleums sold as flooring. 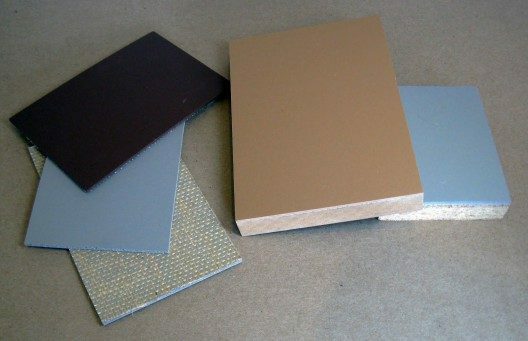 Linoleum is sold ‘mounted’ on rigid backing material such as MDF or Particleboard to a combined thickness of approximately ?” or ‘unmounted’ without rigid support, the burlap backing exposed and the plate thickness of approx. ?”. It may be gray, tan or reddish brown in color. The most common type of unmounted linoleum is known as battleship linoleum and is gray in color. It is offered in plates or by the foot off rolls of various widths. 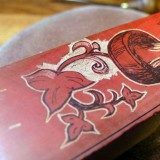 In order to print a plate carved on unmounted linoleum in a letterpress, it must be mounted on a rigid material such as mdf, plywood or particleboard to an overall approx. thickness of .918”. This may be done prior to carving or after the material has been carved. Care should be taken to choose a support material that is flat, free of surface defects and of consistent composition. Linoleum is pliant and will not bridge imperfections such as checks, knots, rough joints or gouges. To mount unmounted linoleum, use a contact adhesive, wood glue or PVA. Ensure block remains flat as it is allowed to dry. Several art material suppliers offer pre-mounted linoleum on mdf or particleboard blocks ?” thick in common sizes (2 x 3, 4 x 6, etc.) which only require moderate shimming to the proper height (.918”) for printing. This is the simplest method of obtaining linoleum suitable for printing. Linoleum has no grain direction, is relatively soft and can be carved in all directions without consideration for splintering or chipping. 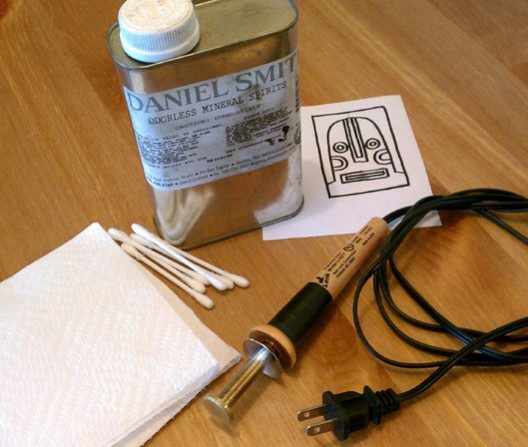 Tools made for relief carving in wood as well as xacto knives and scalpels may be utilized for carving. The linseed oil that forms part of linoleum composition continues to harden over time, the newer the material is, the more pliant it will be and easy to carve, though moderately age hardened or cold linoleum can be softened somewhat with careful warming under a heat lamp, hairdryer or forced air heater to reduce the amount of effort needed during carving. If the linoleum is too old, left in sunlight for an extended period, or exposed to temperature extremes of hot and cold it can become brittle, difficult to carve and prone to cracking. Due to the calcium carbonate (or other mineral content) which forms part of the linoleum composition, carving tools will dull more quickly than when carving wood. Tools should be honed on a leather strop periodically during use to maintain a keen edge. 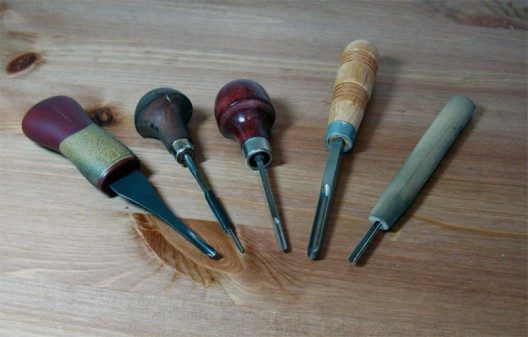 Tools suitable for relief carving or woodcuts are suitable for carving linoleum. Carving tools vary widely in price and quality. Inexpensive student tool sets are usually of inferior quality and may frustrate the beginner, present a safety hazard and yield poor results. A small group of good quality gouges—a 1mm viener for fine details, a 3mm gouge for medium work and an 8mm or larger gouge for clearing areas is preferable to a larger set of cheaper student tools. The design of carving tools varies and a matter of personal preference and carving technique. Palm handled tools yield good control for detailed work but, can be tiring when used for large areas & long sessions. Straight handled carving tools are good for expressive carving styles, larger images and clearing large areas. Japanese woodblock carving tools are held and guided through the material in a different fashion than their western counterparts and may be found useful. Regardless of tool style employed, all tools should be kept sharp, clean, and the handles tightly fitted to the cutting shaft. As mentioned earlier in the text, tools used for carving linoleum will dull somewhat faster due to the abrasive characteristics of the linoleum composition. A leather honing strop or block, properly prepared with honing compound should be kept handy during carving sessions and the tool occasionally honed to maintain a sharp edge and prevent the need for stone sharpening. A combination coarse/fine sharpening stone is useful for repairing nicked tools or tools that have become dull during use if not honed. Additional useful materials are a bench hook which provides a means to brace the linoleum block during carving without endangering hands, this may also be achieved using non-slip shelf lining material. When selecting a mounted linoleum block or mounting linoleum yourself, ensure the block is flat and free of any distortion. Holding a straight edge in the center of the block along each axis or placing on a known flat surface and checking for any rocking motion is sufficient. Check carefully for any depressions or nicks in the surface that may end up in your intended image area. When new, the surface of a linoleum block is very smooth and may be used ‘as is’, however, the additional effort of a very light overall sanding of the linoleum surface with 300 to 400 grit sandpaper will improve the ability of the surface to capture ink which will provide a more dense ink coverage when printing. For blocks 5 x 7 or smaller, apply spray glue to the back of a sheet of sandpaper and mount on a known flat surface, such as a glass inking slab. Place the linoleum block face down and move the block in small circles until the surface is uniformly sanded to a soft flat finish of even tone. If the block is larger than 5 x 7, use a sanding block longer than the block is wide and carefully sand the surface while the block is face up secured to a table with either non-slip cabinet matting or tape. 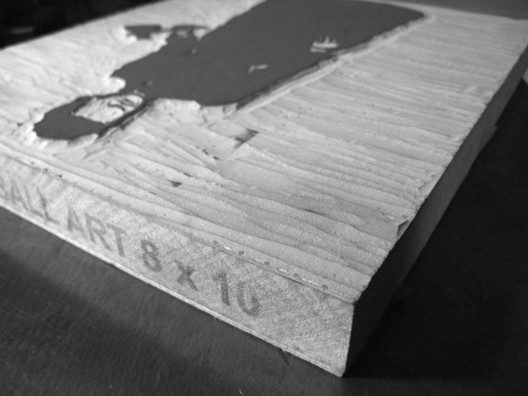 Be careful to keep the sanding block flat and parallel to the surface to prevent rounding the edges which will cause significant problems on press. Do not simply hold the sandpaper in your hand to sand, your fingers will cause uneven pressure and result in a surface with high and low areas which will not print well. If you do not have a commercial sanding block, a flat & straight section of lumber (such as pine 1 x 4) may have sandpaper glued or wrapped around it as a substitute. You may also use an electric palm sander, although you run the risk of quickly ruining your block unless you have very excellent proficiency with the tool. Hand sanding takes only a few moments and is the cleaner, quieter and safer method. The most simple method of preparing an image on the linoleum block is to draw directly on the linoleum surface with pencil or marker, bearing in mind the resulting image will be reversed when printed. No materials other than a pencil or marker are required for this method. Designs may also be transferred using transfer paper or carbon paper sandwiched face down between the drawing and the linoleum surface and a ballpoint pen or other stylus used to trace the drawing the resulting pressure will transfer a copy in carbon/graphite to the linoleum surface. The drawing to be traced should be reversed rather than ‘right reading’. 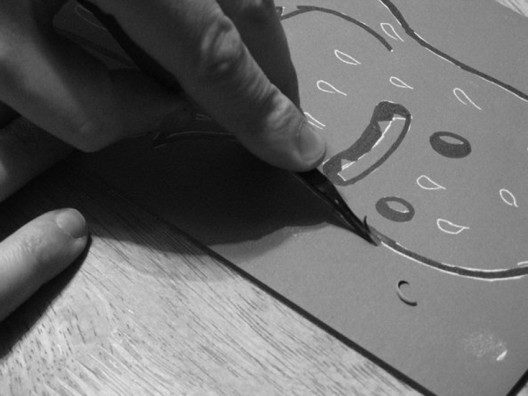 The resulting line transfer should be re-traced with a Sharpie or other marker if you intend to proof your image frequently while carving, as it may wipe off when exposed to ink. Materials required for this method are transfer paper/carbon paper and a copy of your image reversed for printing and sized for the block to be used. You may also simply ‘shade’ or cover the back side of the paper your image is drawn on with a thick layer of soft graphite pencil until the image area is covered, this will then transfer to the block surface as carbon or transfer paper would, although clarity may be variable. The toner transfer method is technically complicated, but yields very fidelitous results, important if the image has a high level of detail. This technique of image transfer to the block requires the use of a heated transfer tool, a photocopy and mineral spirits. This method should only be used in a properly ventilated and fire safe environment. The transfer tool is hot enough to cause severe burns and must be kept under observation during use. Mineral spirits are flammable and should be stored and applied in an area away from the area where the transfer tool is set up to be used for the procedure. Heat transfer tool not greater than 18w capacity. These are available widely in stores selling wood carving tools and most craft stores. Higher wattage tools will damage linoleum immediately and cannot be used. Photocopy is placed face down, aligned properly and secured to the linoleum block with tape. Warnings : Pausing in one area may cause paper to scorch and linoleum to melt, keep tool in constant motion. Tool will cool during the image transfer process, working methodically in small areas with occasional pauses to allow the tool to recover proper operating temperature will give the best results. Take frequent breaks, hone your tools, clear away accumulated waste material from your work surface, stretch your hands, arms and back from time to time. The more relaxed and intent you are to the task at hand the better quality your resulting carving will be. Long intense carving sessions may not yield as good results as several well spaced shorter sessions. Carving while tired, distracted or under pressure is a recipe for injury at worst, poor results at best. 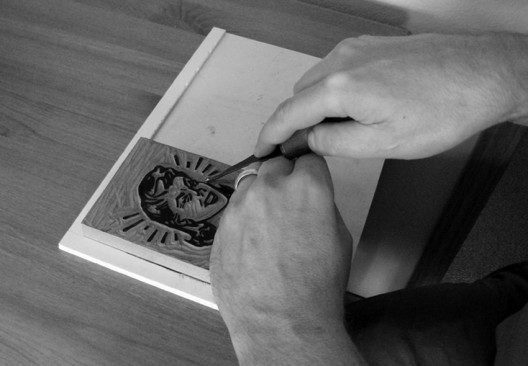 Once the image has been successfully transferred to the block, the carving process may begin. Using either a bench hook or non-slip matting, brace the linoleum block on a clean, smooth work area large enough to allow you to place both elbows comfortably on either side of the block. Using an angled light source will help you assess the quality and depth of your carving. Start by outlining large solid areas, work into details after the overall image form has been developed, leave large areas to be cleared last. If rendering simple images such as lettering or silhouettes, carve just outside of your marks, this will leave room for ‘tuning’ of line quality after the majority of the work is done. You may proof the block from time to time with water soluble block printing ink to check your work. If you do not have access to a proofing press, hand rubbing with a baren or wooden spoon is acceptable. You may also proof with carbon paper, but this may not yield sufficient detail or indicate stray marks in cleared areas. Once the image is carved, clear away areas of the block that will not print to just above the burlap backing. 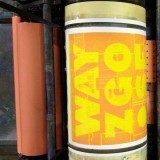 This will prevent stray areas from inking and printing. However, if you expose the burlap, the resulting fibers may stand up, fouling ink rollers and printing as smudged areas during print run. Remove them completely and seal any remaining tufts with PVA or white glue. Never carve towards your hands or body; this means be aware of where your hands are! The most common injury occurs when the tool slips and buries itself in a hand inadvertently placed in the direction of carving. Always brace the linoleum behind your carving hand with downward pressure on non-slip matting or use a bench hook. Once the image area has been carved, the block must be carefully cleaned of loose material left from the carving process with a soft bristle brush. Traces of the transferred image should be removed with a clean lint free cloth wetted with acetone based nail polish remover. If left on the block, graphite, toner, Sharpie and other markers used during image transfer may loosen when exposed to the solvents in the ink body and print as unwanted ghost marks or darken or discolor pale colors. Carefully and gently wipe away all traces of the image transfer until the linoleum is clean and uniform. Using a type height gauge check the block for proper height and shim as needed with chipboard, pressboard or packing to properly raise to .918”. Carved Linoleum block ready for printing, shimmed with two pieces of chipboard to proper printing height of .918. Note depth of carved areas, just above the burlap backing. A properly prepared linoleum plate can yield many hundreds of impressions before showing signs of wear. Over time, the linoleum block will naturally and unavoidably show wear due to impression, abrasion from paper and decomposition of the surface due to interactions with ink & solvent. After printing, excess ink may be removed from the surface of the plate with a cloth lightly dampened with solvent, allowed to dry, then stored flat at room temperature away from direct sunlight and humidity extremes. For additional protection, blocks can be wrapped in kraft paper, and a proof of the block may be taped to the outside of the package for easy identification.